A little less than 2 years ago AMD launched their latest generation of video card products, the Radeon HD 7000 series. Based on the brand-new TSMC 28nm process, these have been some of the most successful AMD products in years, seeing AMD fight with NVIDIA head-to-head for a time for the performance crown. Perhaps as a testament to that success they’ve quickly been racking up one of the longest retail shelf lives of any AMD product, with the first 7000 series products quickly approaching the 2 year mark. Over time however all things change, and in the world of video cards it can never come a moment too soon. Previously announced at AMD’s 2014 GPU Product Showcase and launching this week will be AMD’s successor to the Radeon HD 7000 series, the Radeon 200 series. AMD doesn’t have a new process node to work with here and as such we’re not going to see anything mirroring the likes of the 7000 series launch or the 5000 series launch, but by building upon their hardy Graphics Core Next architecture, the company does have some interesting ideas in how to refresh their product lines for the next generation. Today we’ll be looking at the Radeon 200 series in detail – sans the yet be launched Radeon R9 290X – including both the feature sets and technologies that are arriving alongside the new 200 series cards, and several of the cards themselves. AMD is going to be saving their best for last, but they have a warm-up act that should at least capture the attention of video card enthusiasts everywhere. Starting with AMD’s 2014 GPU lineup the company is changing the naming of their products. The Radeon HD [product number] naming scheme that has served the company since the launch of the HD 2900XT in 2007 will be going away. Replacing it will be a new naming scheme, in the format of Radeon [product category] [product number]. The new naming scheme means that names like Radeon HD 7970 GHz Edition and Radeon HD 7770 get replaced with names like Radeon R9 280X and Radeon R7 260X. Changes in numbering aside, the use of product categories is new for AMD in the GPU space. At launch there will be the R9 and R7 categories, the former signifying AMD’s enthusiast level products, while the latter signifying AMD’s mainstream level products. This new naming scheme brings AMD’s GPU naming in-line with how they already name their CPUs – A10, A8, etc – and presumably we’ll see lower R numbers on future integrated GPUs. Meanwhile in the world of retail desktop this new naming scheme also ends up being very reminiscent of NVIDIA’s existing GTX and GT designations for their video cards. As far as product numbers are concerned, with AMD having already reached 8000 in the HD series they’re essentially starting from the bottom, moving from 4 digit numbers to 3 digit numbers. Unfortunately the insufferable suffixes are back as of this generation, much to the chagrin of text parsers everywhere, after AMD went for more than half of a decade without making heavy use of them. The “X” suffix will be used to indicate the higher performance version of a product line, similar to how AMD has used 70 and 50 in previous version numbers. So far we’ve only seen products with and without an X, e.g. 260X or 250, but given AMD’s penchant for pushing out 3 and sometimes 4 different cards in a single line, X may not be the end of the suffixes. So what products will comprise the initial R9 and R7 200 series? As part of their public product showcase last month AMD has formally announced all of their initial products by name while withholding the specifications until the product launches themselves. At the top will be the mysterious R9 290X, which will not be launching today, and below it we have the R9 280X, R9 270X, R7 260X, R7 250, and R7 240. The latter 5 cards are all launching this week and AMD has released the complete specifications, which we’ve laid out below. Core Clock (For Sure) 850MHz 1000MHz 1000MHz? R9 290 aside, what you’ll notice about the 200 series is that AMD is going to be issuing new SKUs for their existing GPUs. For today’s product launch there will not be any new GPUs, just new configurations of AMD’s existing Southern Islands and Sea Islands GPUs. AMD has been very explicit in not calling these rebadges, and technically they are correct, but all of these products should be very familiar to our regular readers. Even coming up on 2 years after its launch Tahiti will continue being a magical place for AMD, forming the basis of the R9 280X, in what’s essentially a lower clocked 7970GHz Edition. Meanwhile the Pitcairn based 7870 gains PowerTune Boost capabilities and becomes the R9 270X, and the Bonaire based 7790 also gains boost capabilities while becoming the R7 260X. Finally Oland, the littlest member of the Southern Islands family, finally gets a retail desktop release with the R7 250 and R7 240. Oland was introduced several months ago, but until now has been OEM desktop and laptop exclusive. Speaking of reused GPUs, with this generation of products AMD is pretty much doing everything they can to drop out of the codename bingo game. Compared to past years AMD is being extra careful not to use codenames in any public comments. Their new high-end GPU, or even their existing GPUs, are not something they will name by the codenames we’ve come to know them by, instead referring to them by configuration and/or the products they’re in. AMD has been bitten by the use of codenames in the past – the enthusiast community at large spent the better part of a year salivating over rumored “Sea Islands” GPUs that never came – but this does appear to be an attempt by the company to obfuscate the relationship between products and the GPUs they contain, so that they can instead focus on performance. To that end this means we’re still going to be looking at the same GCN feature set schism. R9 280X and R9270X are of course based on the original GCN architecture, while the Bonaire powered R7 260X is based on AMD’s revised GCN architecture. Since AMD has still not officially assigned names to these architectures, and because “Sea Islands” has been badly mangled by now, we’re going to continue referring to these architectures as GCN 1.0 and GCN 1.1 respectively. At least until such a time where they get a proper name out of AMD. With that said, while AMD is doing their best to drop codenames, they are technically still alive and kicking. Our R9 270X reference card is labeled Curacao, for example, despite the fact that it’s based on the venerable Pitcairn GPU. So AMD still has codenames internally, apparently including new names for existing GPUs. Moving on, while the GPUs behind today’s cards are unchanged, the cards themselves are not. All of the cards receive new firmware with new functionality that’s not present in the 7000 series. Chief among this is the ability to drive three TMDS-type displays (DVI/HDMI) off of one card, which we’ll get to in detail in a little bit. R7 260X in particular also gains audio capabilities via AMD’s TrueAudio technology, which is finally being activated after being shipped deactivated on the equivalent 7790. Of course a bit part of today’s launch isn’t just about branding or firmware features, but it’s also about pricing. AMD is essentially using this launch to formalize their ever-continuing price cuts, and to reframe all of their products in their new positions as lower priced, lower tier parts. For this same reason we’re also going to see an evolution in card designs from AMD’s partners, not only as iteration on previous designs but as cost optimizations to help meet their new price targets. On the manufacturing side of matters, with any new GPU manufacturing node still well on the horizon this is a rather straightforward and logical move for AMD. With today’s launch AMD is shifting their stack down while introducing products based on their new, larger high-end GPU (est. 425mm2) to make up for the lack of progress on the manufacturing side. GCN is already a very solid architecture, and while any architecture is going to have attributes that can be tweaked for performance, there’s only so much that can be done without a smaller process node. Ultimately while AMD doesn’t have new GPUs or access to a new manufacturing node today, their cuts over the years have kept video card prices on their regular downward slope while the hardware itself has become marginally faster. The 7970, introduced just shy of 2 years ago at $550, is now the faster $299 R9 280X, the 7870 at $350 is now the faster R9 270X, etc. Without a new manufacturing node AMD can’t move the power/performance curves – in fact power consumption is going to be up slightly to compensate for the higher clockspeeds – but price cuts have pushed what was the high-end farther down the price/performance curve. The final piece of the picture though will be the R9 290X, which is a story for another time. The fact that AMD is mostly replacing old cards with new cards based on the same GPUs as those old cards does put us as reviewers and enthusiasts in an odd spot though. Despite the fact that GPUs like Tahiti and Pitcairn are coming up on 2 years old there’s no sign of retirement for the GPUs themselves, only the first generation of products based on them. The typical shelf life for a GPU is 1-2 years, the extreme cases being highly successful products like AMD’s Juniper GPU (5770) or NVIDIA’s G92 GPU (9800). However in the case of the 200 series and its reused GPUs AMD is explicitly calling this their 2014 GPU lineup, with no indication that these products are anything less than permanent. With any new manufacturing process still well into the future we can safely say that we have reliable visibility into future AMD GPUs. We’re clearly going into a 3rd year of Tahiti and Pitcairn, and it may end up being most of a year by the time we’re finally done. If this proves to be the case then this would certainly rewrite the book on GPU shelf lives. Meanwhile with the 200 series hitting the scene, the Radeon 7000 series is being prepared for retirement. AMD and their partners are giving the 7000 series a price cut and a push to clear out that inventory and to focus on their 2014 parts. As such the various 7000 series cards are expected to come down in price to match or beat their 200 series equivalents, though this will only last so long as the inventory of old cards does. Moving on to retail matters, buyers of the 200 series will want to pay attention to the fact that the 200 series is not currently part of Never Settle Forever. AMD’s video game bundle program is not being extended to the 200 series at this time, so on top of the price cuts for the 7000 series they will also have an active game bundle while the 200 series does not. AMD for their part isn’t saying anything concrete about the future, but they are strongly hinting that this is temporary, and that the 200 series will be added later after the 7000 series is cleared out in order to give buyers an extra incentive to pick up a 7000 series card first. Given AMD’s situation it makes a lot of sense, but it means we’re in a weird position where in the first time for over a year it’s NVIDIA that has the better bundle, with their current Batman: Arkham Origins bundle. For launch purposes, this week’s launch will be a hard launch. Based on existing GPUs, there’s no chance of an inventory problem or shortage to contend with. But AMD is lifting the NDA on these cards earlier than they’re scheduled to go on sale. The new 200 series cards won’t officially become available for sale until Friday the 11th, so there will be a few days’ gap between the launch and retail sales. Finally on a housekeeping note, we’ll be splitting up our coverage of the 200 series launch over two articles. 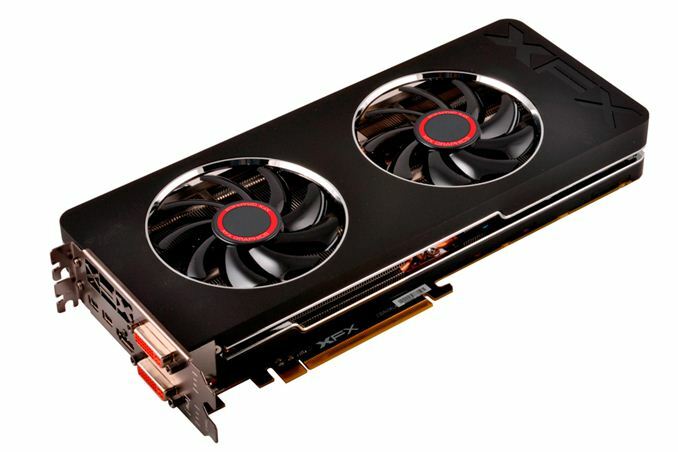 As AMD is launching a number of cards this week – we have 4 in hand just for today’s NDAs – we’ll be covering the 200 series in general and the R9 280X as one article, while focusing on the lower end R9 270X and R7 260X as a second article. So if you’re looking for R9 270X or R260X performance, please be sure to check in later. Yep. Article was probably set to auto-post but the associated images (and apparently the last two pages) are missing. Anyway, the gist of this seems to be that the 280X is the price and performance the 7970 should have been two years ago. But since they went with crazy-high pricing on the 7900 series, they can now release this product at the price point that would have been appropriate two years ago and still make out like bandits with reworked 7900 hardware which must be exceptionally cheap for them to produce at this age of maturity on the fabs. Good for their revenue, but probably not going to entice NVidia to drop their prices much. If this is what we're getting as top-of-the-line in the normal-people price bracket from AMD, it makes me happy I picked up a 7970 on a great sale recently. How is that different from EVERY OTHER COMPANY out there? What about NVIDIA to introduce Titan at a 1000 when their next highest card was at 500? Correction: "Am I the only 'one' who is happy....."
I don't think I saw him comment on how much he was glad nVidia wasn't like AMD. I'm pretty sure he was just commenting on how AMD was doing something he didn't like.